Clarence McMillan - PETAL et al. Clarence McMillan is an Award-Winning Television Producer, Graphic Designer/Illustrator, Film Documentary Producer and Educator. McMillan attended the prestigious School of The Art Institute where he focused on painting and drawing. 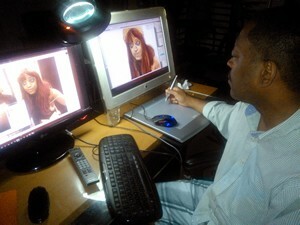 He studied Advertising Art and Multimedia at Columbia College, both in Chicago, IL. With a background in art and film, McMillan brings a unique, discriminating eye to video and film development. 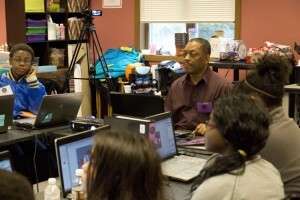 He has produced numerous documentaries for non-profit organizations nationally and abroad, and is currently engaged in conceptual drawings and package design for video games, working with a technical and creative non-profit, and is working on a documentary with footage filmed in the Republic of Cameroon. He also documented the crumbling infrastructure of Jeremie, Haiti, prior to the devastating earthquake there. McMillan, a Certified Producer with over 15 years of studio and remote video operations experience, is also a certified Commercial Artist. He is often sought after for his talent and technical abilities. He is the recipient of numerous awards for his outstanding illustrations and designs. McMillan is the recipient of the coveted Telly Award for the Documentary “Redemption Song”. The Telly Award is a premier award that honors outstanding local, regional, and cable TV commercials and programs as well as the finest video and film. His credits also include Videographer and Editor for the recently purchased Jack Daniel’s PSA “Be Smooth.” He’s also the recipient of the PCC Network’s “Portrait of Achievers Award” for outstanding work in video production. McMillan, a former member of The National Academy of Television Arts & Sciences (NATAS), has chaired and judged the US International Film & Video Award submissions, and served as judge for several other television and film awards events. As an educator, McMillan works with at-risk youth and adults to bridge the digital divide and provide them with alternatives to the traps of inner city that could possibly ensure setbacks without positive guidance. Under his mentorship, many students were able to secure jobs, subsequently started their own businesses or went on to finish college. McMillan is also involved in Animation, Graphic Design, Multimedia, Conceptual Art/Storyboarding, Motion Graphics, interactive media and enjoys participating in hackathons & game jams all over the country.